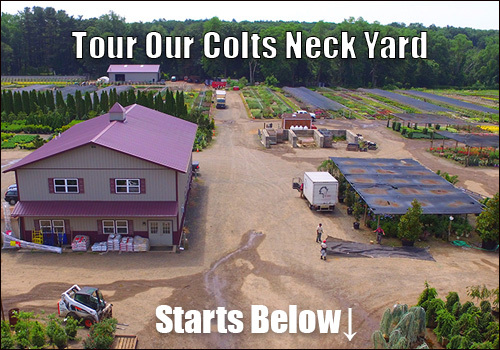 Not only is Colts Neck the larger of our two wholesale-only nursery sales yards, it is a significant growing operation as well. This is as fine a wholesale only nursery as you will find anywhere. 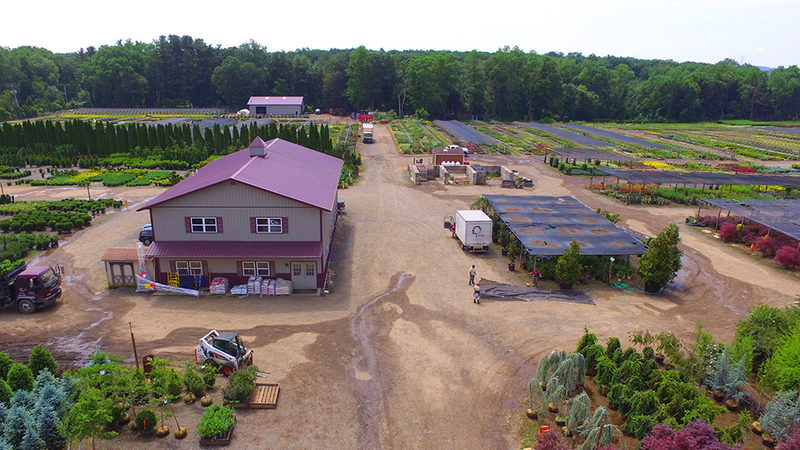 We routinely stock well over 500 different species of trees, shrubs, perennials, ornamental grass and seasonal plants at this L.P. Statile location. 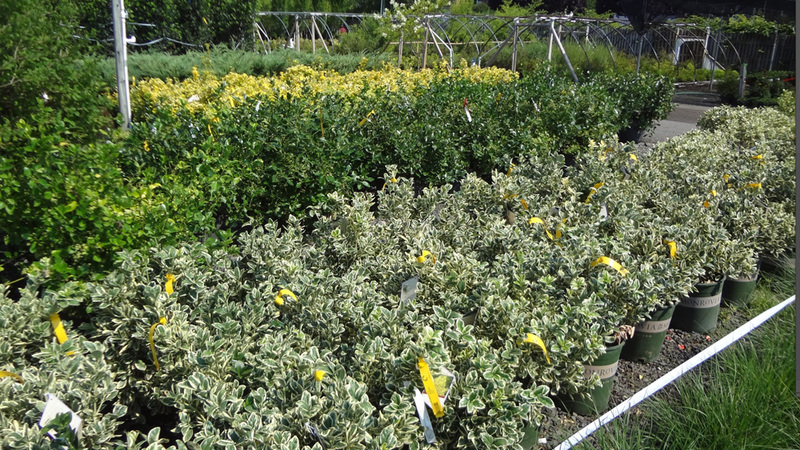 We typically have a deep inventory of plants as well so we can supply virtually any size job. 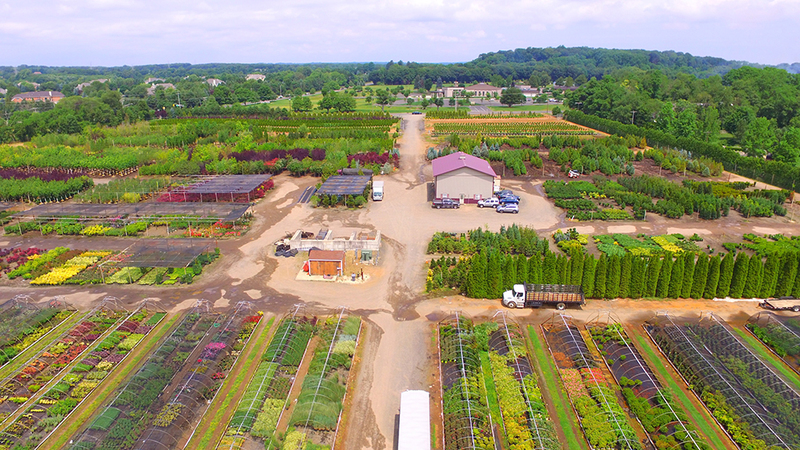 Our Colts Neck yard routinely carries what we feel is an exceptional inventory of perennials – both in terms of variety and quantity. We load quickly and safely, deliver daily, and strive to provide the best customer service available. 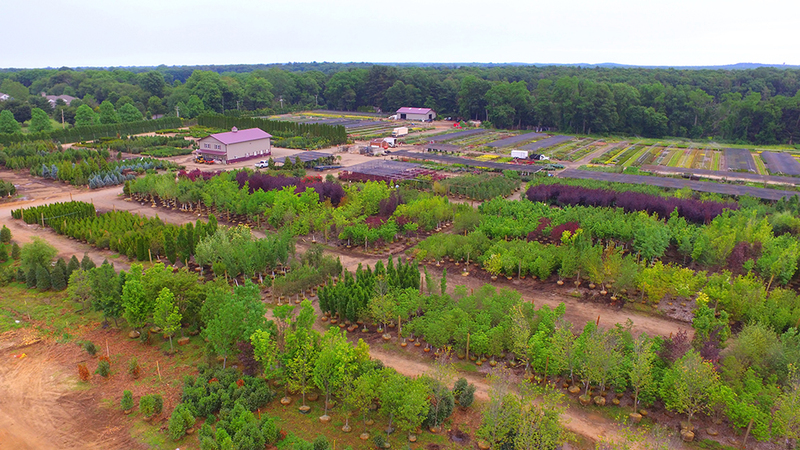 We urge you to stop by and visit Colts Neck – it is an extraordinary wholesale-only nursery for New Jersey landscape contractors. The main office, checkout counter, tools and hard goods inventory, and our staff are in the building to the left. Palleted hardgoods and extra large tools line the front porch. The shade house to the right of the main office houses an ever changing display of what is in flower, tropical plants for patio and pool containers flourish here, and specimens (including Southern magnolia) often line the perimeter. The nursery unfolds around you on all 4 sides. To the right are deciduous trees and many shrubs, to the left are evergreen trees, boxwood, ilex and more! 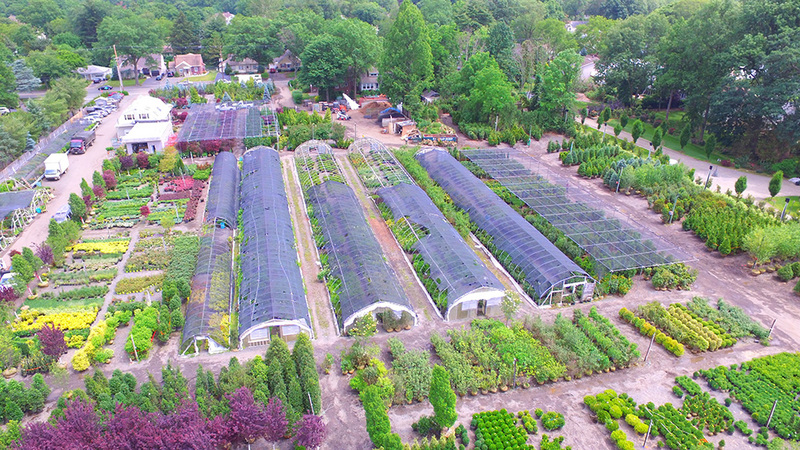 Ahead and to the right and left are dozens of hoop houses filled with both shrubs and perennials. Straight down this road brings you to the core of our growing operation, which not only grows on this piece of property but on two nearby pieces as well. This photograph focuses on the deciduous tree area at Colts Neck. You can see – it is very large. Not only do we stock over 50 varieties of deciduous trees, we have a deep inventory of most of them – and the quality remains great throughout the year. We always have specimen trees, we have many unique varieties, and our service is top notch. We are a unique resource for landscape contractors and allied professionals. The quality of our plant material is outstanding throughout all lines at both locations. L.P. Statile stands for quality – it has always been the driving force behind what we do. 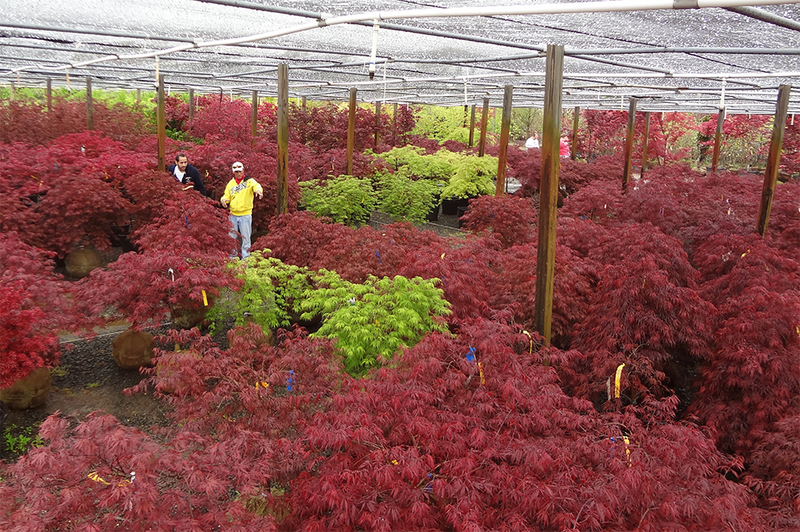 We sell the widest selection of the highest quality plants throughout the contractors planting season. You have moved past the office on the main driveway. As you pass the office shrubs fan out to your left and right. 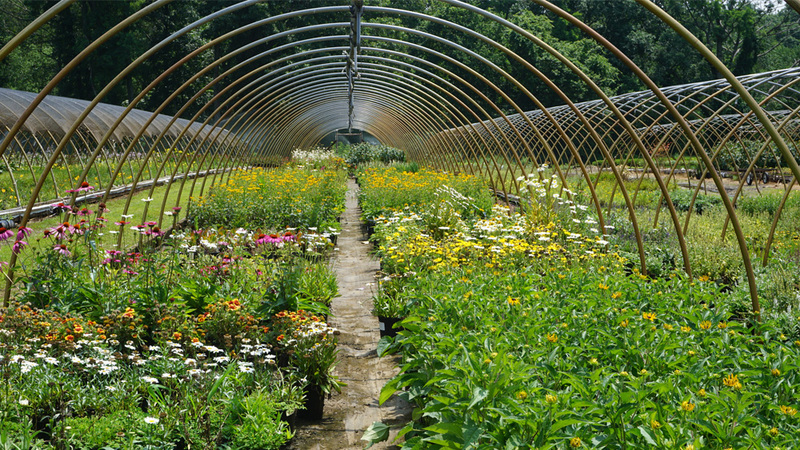 Continue on and you are in the center of hoop houses filled with nursery stock and perennials. We’ll help you get to know how things are laid out. Once you do you can quickly find that exact plants you are looking for, and we’ll load your plant material quickly. The perennial houses are amazing. There are hundred’s of varieties – often hundreds of plants of inventory within a variety – in well organized houses. We often have multiple sizes of popular varieties and our perennial pricing is outstanding. We are a wholesale-only business – we do not sell retail. L.P. Statile has enjoyed a Springfield New Jersey location for nearly 100 years. 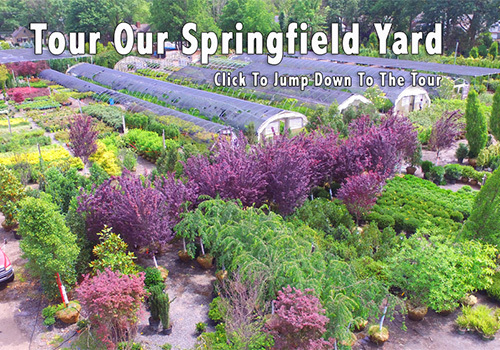 We carry a full line of trees, shrubs, perennials, annuals, grasses, mulch and hardgoods in Springfield. 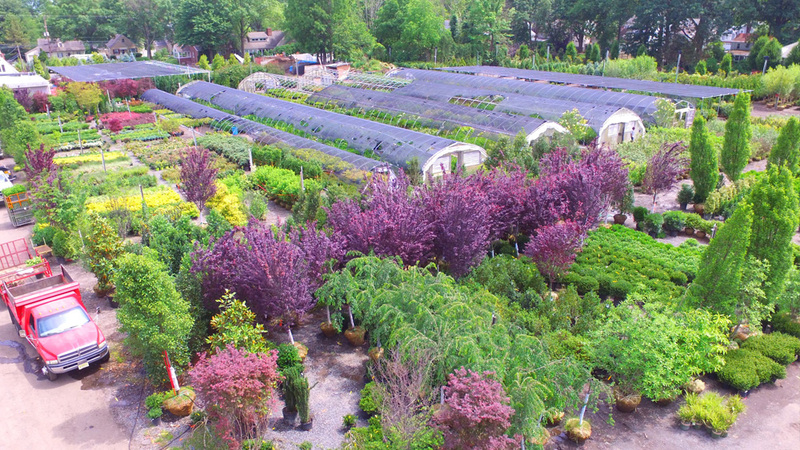 The compact but expertly stocked and operated nursery features a deep inventory of a wide variety of plant material, and as always with L.P. Statile – the quality is outstanding. From this jewel of a location we regularly service over 900 landscape and building contractors. 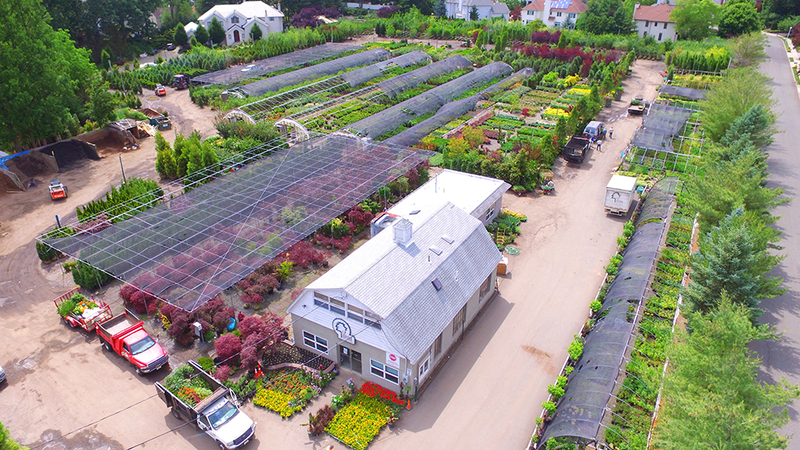 If you are a Union, Morris, Somerset, or Middlesex county New Jersey landscape or building contractor, architect, designer, golf course, school, or government representative we invite you to tour our wholesale-only yard at 490 Mountain Avenue in Springfield, New Jersey. We have a great mix of plants for sale – all the popular varieties you would expect, but plenty of unique varieties as well. With nearly 100 tree varieties to choose from, over 200 shrub types, a large selection of perennials and ornamental grasses we can supply virtually any size job. Shown here is the middle section of the nursery that includes shrub and perennial houses as well as the start of of the tree sections. We pride ourselves on quality plants – it has been a calling card for nearly 100 years. 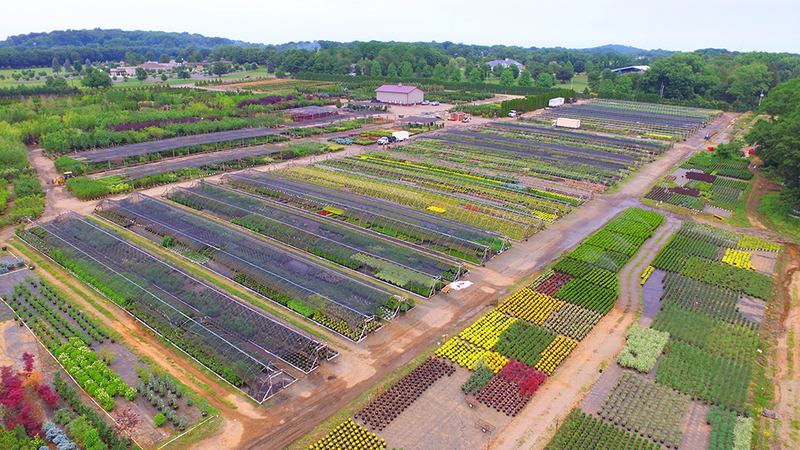 We deal with over 100 growers throughout the country to obtain the finest plant material available anywhere. The building in the lower section of the photograph is our offices and tools/hardgoods sales area. We also carry multiple types of mulch and topsoil. 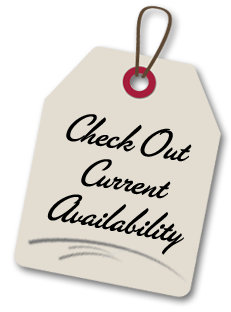 If you are looking for a one stop shop to purchase your plants. mulch, tools, chemicals, and other hardgoods – Springfield has you covered.